The Scholarship application process is detailed with various deadlines. Due dates depend upon the scholarship(s) you are seeking. Please read carefully so you can take full advantage of the funds we offer each year. A missed deadline is a missed opportunity. Our goal is to streamline the application process, and we do that using our Johnson County Community Foundation (Indiana) form. Applicants will fill out the common form one time and then submit additional information specific to each scholarship being pursued. In addition, there are a few scholarships, such as the Lilly Endowment Scholarship, that use unique applications, and we provide a separate link for each one. The Common Form Scholarship application has closed! If you have questions, please email Stephanie Fox. Lilly Endowment Community Scholarship application has closed! October 6, 2018: Top Candidate Interviews – candidates were notified via email. Mitzi Harris Martin Healthcare Scholarship application has closed! 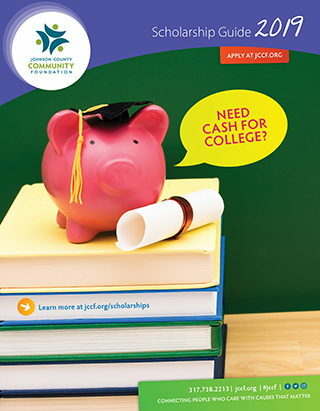 JCCF produces an annual Scholarship Guide. The 32-page brochure gives a comprehensive overview of scholarship opportunities and application steps. View it here, pick up a copy from your school guidance office or stop by JCCF. Note: The Scholarship Guide is a 32-page pdf document (3.2 MB file). WANT TO KNOW MORE ABOUT APPLYING FOR A SCHOLARSHIP? Visit with your guidance counselor first. | Refer to our scholarship guide. NEED TO KNOW MORE ABOUT JCCF SCHOLARSHIPS? Contact JCCF today.